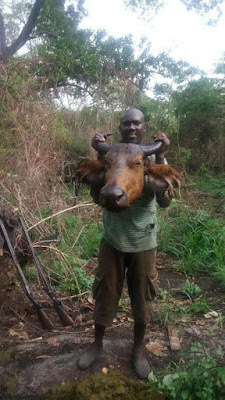 A hunter identified as Isah Anavberokhai of Iyakpi South Ibie Kingdom in Etsako West Local Government Area of Edo state has been hailed and applauded for killing something very rare and strange. The Hunter has just killed a Buffalo while hunting. He shot dead the wild animal on Monday, April 10th. Are we not supposed to preserve these animals? ?